We like to call ourselves a "community music store." What does that mean? It means that we are more than just a place to buy instruments and take lessons, we are a gathering point for musicians of all levels in our local community. We are a resource for performers, teachers, students, jammers and players of all kinds. We strive to make music accessible to as many people as possible. Specifically, we donate all of our labor to Kidznotes, maintaining an impressive fleet of stringed instruments for Durham's own non profit strings program provider. We also travel around town with our "Petting Zoo," a collection of musical instruments that exist specifically for kids (and others) to try 'em out. 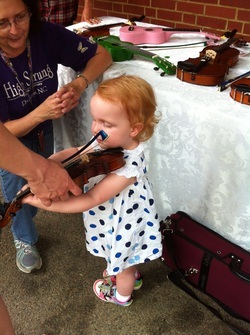 We bring the Petting Zoo all kinds of places, including the Durham Farmer's Market, Durham Symphony Orchestra concerts, music festivals and more (click here for upcoming dates and times!). We also team up with other organizations, such as the Music Maker Relief Foundation that headquarters in Hillsborough to support traditional musicians throughout the southeast. Ironing Board Sam is one of the first of their artists to offer a workshop through High Strung. Check out our blog for more stories of High Strung in the community!